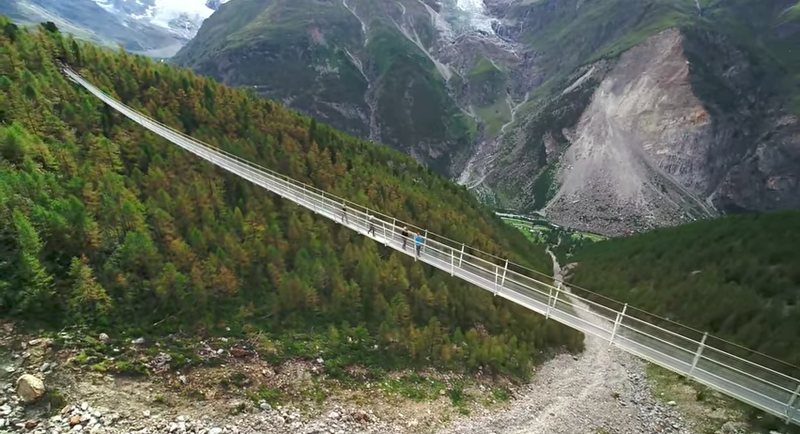 If you’re looking for a cheap thrill, then this new pedestrian suspension bridge in Switzerland might be a fun time. I’m serious. Hanging nearly 28 stories above ground and spanning about one-third of a mile, it’s said to be the world’s longest pedestrian suspension bridge, according to USA Today. If you’re feeling bold, good for you, go take a walk: it’s now open to the public. Officials in Switzerland were on-site to open the bridge after only 10 weeks of construction, USA Today reports, which is an insanely fast time compared to how things move here. The span is 1,620 feet long and hangs about 278 feet above a ravine, ensuring anyone with a fear of heights will feel a tad queasy along the way. Anyone who’s feeling trepidation about the trek across should also know this: the new bridge replaces a previous span that was damaged by rock falls, according to the BBC—as in, the rocks fell onto the bridge, wreaking havoc and damaging it. Anyway, good luck! I’ll be here, on solid ground, avoiding a Wile E. Coyote-style death.